There is a corridor of collective hysteria in this country. It is the stretch of land between the 101 and 280 freeways, starting in San Francisco and moving south, eventually ending when the latter turns into 680 and intersects with 101 due east of downtown San Jose. 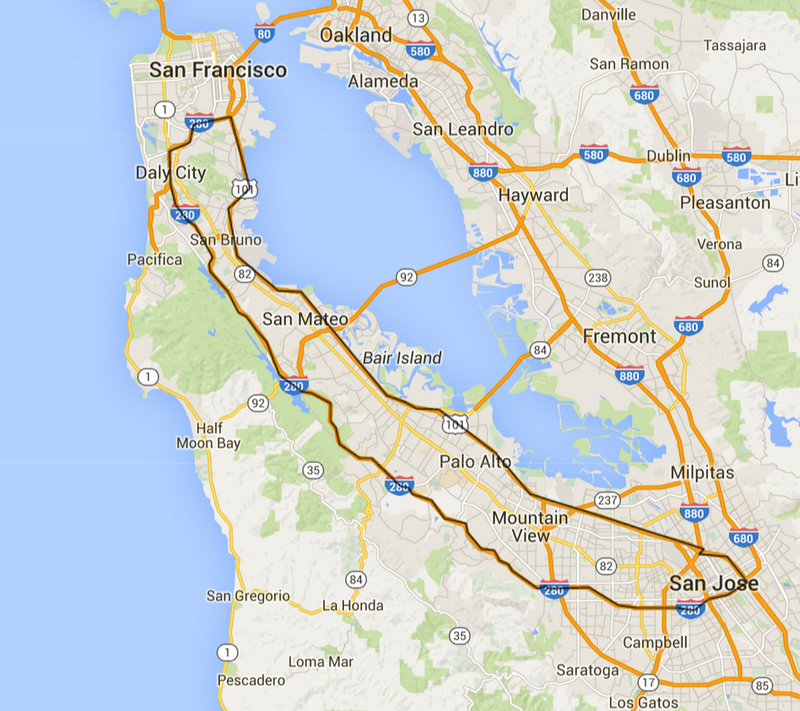 For the billions of people who know nothing about northern California, I’ve marked the area for convenience. A corridor in the San Francisco Peninsula that contains many high-pressure prep schools. This isn’t exact, but this post deals with places that are within two miles of either side. The feature “Campus Suicide and the Pressure of Perfection” by Julie Scelfo in the New York Times is excellent. Halfway through, I was not at all surprised to learn that Kathryn DeWitt, the centerpiece of the story, is from this area. Student suicide is a classic social problem. It’s complex. There are a ton of institutions that may play a part. Norms are established about academic performance and image are difficult to change. If any part of the system is poisonous, it can undermine everything else. School, peers, parents, media, society, politics, money, sanity- all play a part in the problem, and all have to be addressed to create a real solution. The prep school culture in the Bay Area isn’t unique. But it is unusually concentrated and reinforcing. It’s a high concentration of wealthy adults, often from immigrant backgrounds and low economic standing. Their kids are expected to make similar progress in their own lives. The high population means not one but many schools that mesh together to create a social scene where failure means weakness and worthlessness. Harker, Crystal Springs, Castilleja, Bellarmine, Pinewood, Woodside Priory, Sacred Heart. Then there’s all the larger Catholic schools; St. Francis, St. Ignatius, and so on. Then there’s the public schools like Aragon (where Ms. DeWitt went), Gunn, Palo Alto High. All the public schools have a substantial honors track that’s insular and indistinguishable from the private prep schools. Anyone who’s not in the culture would find the whole apparatus absurd. It is, and you should. Suicide clusters at elite high schools and universities should not be a surprise. These institutions have taken the regular level of stigma in society and piles on. Not only is mental illness stigmatized, as it is everywhere, but a million different forms of imperfection are as well. All the contributing factors to suicidal ideation are turned into overdrive. As all three of the stories I’ve linked to concur, students think they are isolated in their unhappiness. It’s a lie that’s allowed to persist. In Scelfo’s profile, it’s the college counselor who breaks through the illusion. People are messed up. There’s a culture supposedly based on intellect and critical thinking that frequently uses neither. And people are dying because of that.